Vanessa atalanta, more commonly known as the Red Admiral, is a common butterfly and found throughout the United Kingdom, usually in open woods, parks and gardens. It is easily identified by its striking brown, black, red and white wing pattern. The underside of the forewing is similar to the upperside, while the underside of the hindwing is an inconspicuously dappled brown-grey. 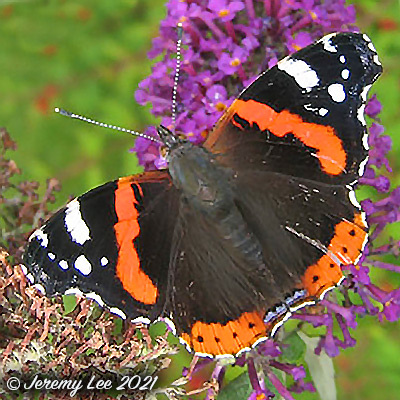 The adults drink from flowering plants like the Buddleia and overripe fruit, such as blackberries, and often vigorously open and shut their wings whilst feeding. The caterpillars, which vary in colour from black through greenish-grey to yellow-brown, have fairly distinct spots with short spines, and are found on stinging nettles, where they feed singly inside a protective tent of leaves held together with silk. The chrysalis is grey-brown with shining golden spots, suspended from the underside of a leaf.